Segmental pavers date back to the ancient Roman Empire. The famous Appian Way began construction in 312 BC, connecting Southeastern Italy and Brindisi to Rome. Originally, the paver roadway was a service road for the Roman military during the Samnite War. Today’s Interlocking Concrete Paver (ICP) is produced in a controlled environment, which results in consistent quality and high durability. Concrete pavers are compacted into coarse bedding sand. The joints are filled with sand and compacted again to interlock. Most recently introduced to the paving industry, Permeable Interlocking Concrete Pavers (PICP), are intended for stormwater runoff reduction. PICP’s are placed over a crushed stone bedding layer and a highly permeable open-aggregate base/subbase, designed to create a reservoir for stormwater storage and infiltration. The joints are filled with open-aggregate crushed stone allowing water to flow through. Increasing urbanization and development of land generates excess stormwater runoff from impervious surfaces (concrete, asphalt, etc.). What were once native forests and farmland has become roadways, subdivisions, and shopping malls. This strains drainage systems, overloading them during periods of heavy rainfall. Flooding and an increase in pollution are a direct result of impervious pavement, which also causes groundwater levels to drop. Streams are experiencing increased bank erosion and sedimentation. With respect to water quality: heavy metals, hydrocarbons, nutrients, rubber, dust and sediment collect on impervious surfaces during dry weather. These accumulations are flushed away during the next rainstorm and enter downstream watercourses. The “first flush” is the initial period of a rainstorm where pollutant concentrations are highest. These pollutants enter streams, lakes, and bays affecting the quality of receiving waters for drinking, recreation and fishing. Treasured fish species such as salmon, and other eco-systems are negatively affected by these events. 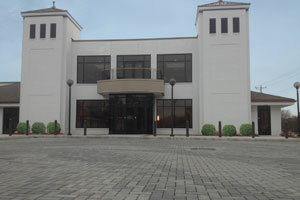 Interlock Paving Systems, Inc. has worked closely with the ICPI (Interlocking Concrete Pavement Institute) to offer a variety of porous pavers. With the newest edition to our PICP Collection, Enviro-Holland and Four Seasons, we offer an old world aesthetic with a new age technology. 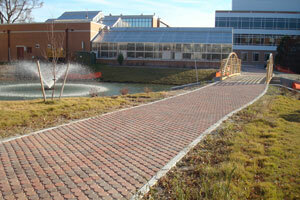 Also included in our permeable line is the Interlock-Eco and Turfstone paver. The void area of Interlock-Eco is created when the pavers are installed. The void area is filled with a crushed #8 or #9 stone allowing rainwater infiltration increasing groundwater storage. 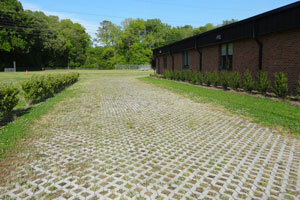 Turfstone, a solid grid paver, can be filled with sand, #8 crushed stone or top-soil to grow grass. According to the Interlocking Concrete Paver Institute (ICPI), industry research has demonstrated that PICP can reduce runoff as much as 100% from a 3 in. (75 mm) rain event with sandy soil and a minimum 12 in (300 mm) thick open-graded aggregate base. Given regional variations in annual rainstorms and PICP base storage capacities, PICP can reduce annual outflows between 30% and 80%. Well-maintained PICP can reduce flow rates by 70% to 90% from intense rain events and up to 100% for many storms. This yields a corresponding reduction in runoff pollution. Meets U.S. Environmental Protection Agency (EPA) stormwater performance criteria as a structural best management practice (BMP) while providing parking, road and pedestrian surfaces. Provides 100% pervious surface by runoff passing through small, aggregate-filled openings between solid high-strength durable concrete pavers. Preserves wooded areas that would otherwise be cleared for stormwater detention or retention ponds. Reduce or eliminates stormwater detention and retention ponds, storm sewers, drainage appurtenances and related cost. May be used on sloped sites with proper design. Reduces contained sewer overflows (CSO) and supports green infrastructure programs. May be designed with underground stormwater storage systems, over many slower-draining clay soils and in cold climates. Reduces pollutants from vehicular oil drippings by avoiding runoff back into the area rivers and streams. LEED (Leadership in Energy and Environmental Design) points eligible for Sustainable Sites, Water Efficiency, Material & Resources and/or Innovative Design; Contributes to Green Globe points. Interlock Paving Systems, Inc. is dedicated to helping customers achieve LEED credits and certification for their projects. We provide documentation for validating LEED credits for PICP and the proper edge restraint. 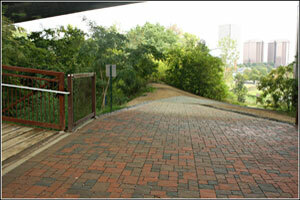 Use of segmental, interlocking pavers can contribute to LEED credits in several categories. Light colored, high albedo materials with a Solar Reflectance Index of at least 29. Construction Waste Management (MR 2.1 & 2.2): Earned when material is diverted away from landfills through recycling and/or salvaging construction, demolition and land clearing waste. Existing pavers can be crushed and reused, kept and used with other projects, or other uses which divert materials from landfills and subsequently contributes to this credit. Resource Reuse (MR 3.1 & 3.2): Earned when building materials are from salvage, refurbished or reused materials, products or furnishings. Existing pavers can be crushed thus contributing in sea wall construction or crushed for use in road construction for this credit. Regional Materials (MR 5.1 & 5.2): Earned when pavers are from materials extracted, processed and manufactured within 500 miles of the project site. Besides the pavers, this also includes associated pavers materials such as bedding sand, base and subbase, and edge restraints.